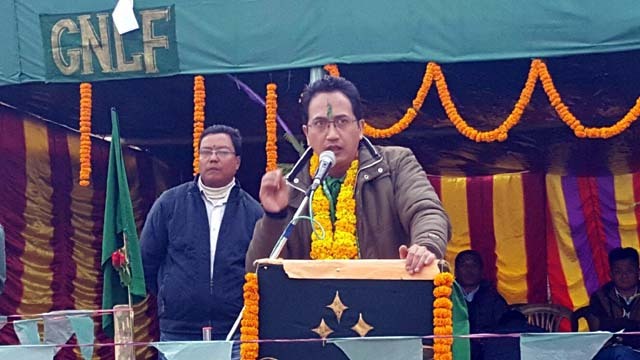 Late GNLF Chief Subash Ghising's son Mann Ghising was on Sunday accorded a public reception by party supporters at a public meeting in the hills. 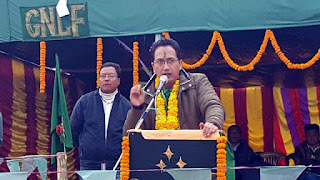 In 2007, his father Subash Ghising did not leave Darjeeling owing to fear, he had left to avoid another round of blood-bath, Mann told the supporters at Kurseong. He was referring to the taking back of her mother's body from Kurseong to the plains in 2007 by Ghising senior "in view of GJM workers sitting on dharna to prevent us take her body to Darjeeling." "Today I am here," he said thanking the supporters. On the GNLF's stand on statehood issue, Mann said 6th Schedule Status for the hills would ensure true autonomy, development and fulfill the aspirations if the hill people. The "bills that reach the Parliamentary Standing Committee are never discarded, so it would be easier for the hills to gain autonomy via 6th Scheduled Status, as both the Center and the State had at one point of time agreed to the status. So it would be easier to convince them."